We are still celebrating The Great American Read! Books and printed copies of the list are available at the library, and we have many of the books on display. Titles are also available as ebooks and eaudiobooks using Libby or RBdigital. 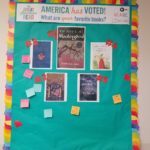 Share your thoughts about The Great American Read on our post-it display behind the circulation desk. How are your book smarts? Play by yourself or bring a team to The Great American Read Trivia Night on Monday, November 5 at 7pm. We close our TGAR series with How We See Ourselves in What We Read on Wednesday, November 28 at 6:30pm. Dr. Laura Nicosia of Montclair State University will discuss how exposure to diverse books impacts the development of critical thinking skills and empathy. This program is also funded by the New Jersey Council for the Humanities. Scotch Plains Public Library is one of 50 libraries nationwide to receive a grant from the American Library Association (ALA) and PBS to host special programs this summer and fall around the new interactive series from PBS: The Great American Read. See the Parade magazine feature on the Great American Read!